Our suppliers' pickers select and choose each apple carefully by hand. The apples are delicately selected for their size, shape, colour and maturity. Apples picked at the optimum time ensure that Copella is made from the tastiest and sweetest apples. by heart and only allow a perfect picking for each blend. Once the apples have been picked, they are placed gently in crates by variety and date and held in chilled storage until they are pressed. In general, later harvest apples store better than early harvest apples, so apples picked October - early November will store well and sustain the supply of Copella through the following seasons. 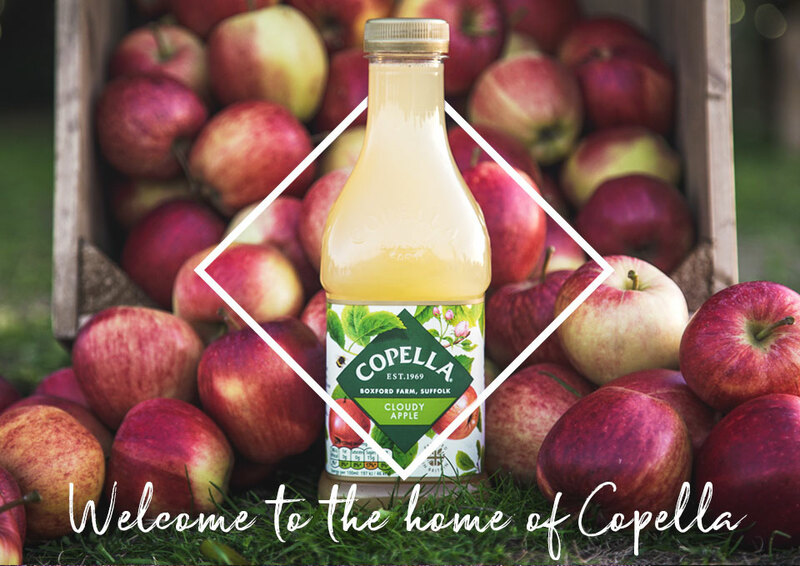 We select apples by variety to create the blend of apple varieties in our press that makes Copella taste so great. Then our quality control team carefully grade the fruit to ensure only the best apples are used. Any bruised or damaged fruit are removed. The apples are then gently pressed to create the famous delicious apple juice Copella is known for. to guarantee excellence of flavour, then quickly bottled. His palate is finely tuned to the delicacies of our apple varieties, to guarantee that all our juice is of exceptional quality before being quickly bottled to lock in that taste of just biting into an apple. The bottles are then marked with our famous green and gold labels and shipped off to the shops. Boxford Farm, Suffolk has been the home of Copella since founded by the Peake family in 1969. The Farm, Suffolk and East Anglia embrace the loveliest aspects to English country life with wide East Anglian skies, many species of wildlife and rolling countryside. 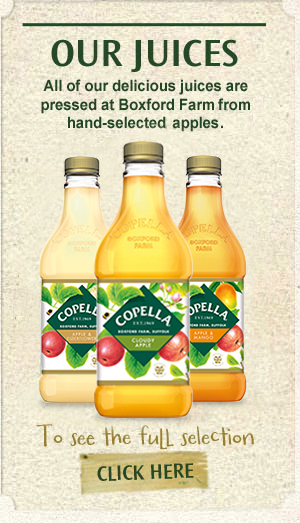 3lb of Apples = 1 litre of Copella. 1938 - The year that Bill and Devora Peake start farming in Boxford. to make our delicious apple juice. Copella loves the many delicious varieties of apples, can you spot the imposter?